This little gnome stood beside the path of the Philosopher's Walk in Kyoto, Japan. On my way to the Silver Pavilion I met him by a step in a small garden. My camera was out of batteries so I borrowed my son's to capture his image. The day was hot and the image I captured looked pale and dry. It lacked the whimsical spark I had seen in the gnome's habitat that afternoon. To better match the image to the memory, I enhanced the color and simplified the lines in the original picture. 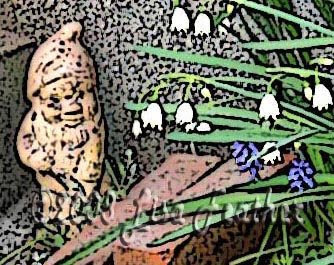 I sharpened the outlines and cropped the edges close to the gnome himself and the flowers he seemed to be tending nearby. I like the result, printed on art paper in a small size, edges torn, and mounted on a much larger mat. It is like looking through a peephole into this Japanese gnome's unique world.